It just won't stop raining. Everything is soggy and people are crabby (including yours truly). 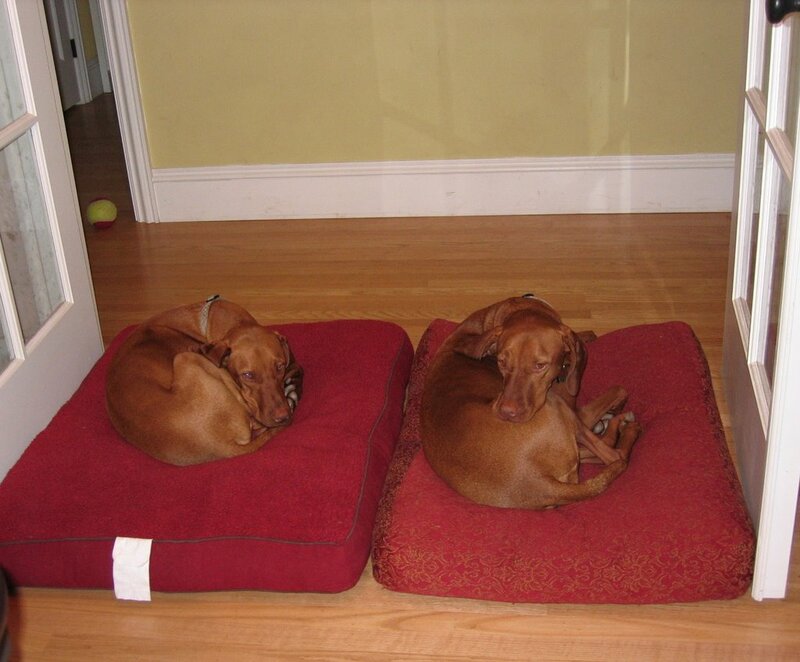 And our dogs - oh lordy they are bored! I actually like rain - I really do! I grew up where the saying was "we don't tan, we rust." But enough is enough. This weather called for some comfort food so tonight's dinner was swiss "steak" served over whole wheat/flax seed fettucine, asparagus and caesar salad. For the steak I used a "veggie pepper steak" I bought at the Asian market the other day. I dredged it in some seasoned flour and browned it on the stovetop. 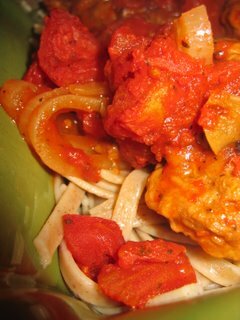 Then I put it in a baking dish, covered it with one sliced onion and a large can of diced tomatoes with Italian seasoning. I covered it up and baked it for an hour. I think when I was a kid we had this on egg noodles - tonight it was whole wheat pasta. The caesar salad was a nice accompaniment. I made Dreena Burton's "Amazing Creamy Caesar Dressing" from The Everyday Vegan. It was so good - creamy and garlicky and wonderful. Another keeper Dreena - thanks! 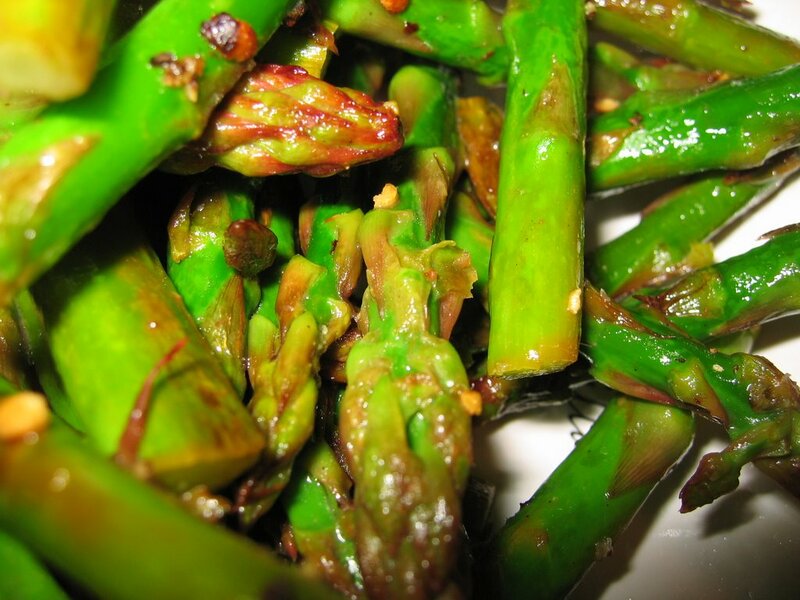 I usually roast asparagus but tonight I just cooked it in a small amount of water until it was crisp tender then added a shot of olive oil to the pan and cooked it for a few minutes - then a generous dose of lemon and some salt and pepper. Yum. A very resigned-to-boredom Renzo and Bella. This is what they do all day while we work! Great pic of the dogs! Love it! The food pictures are always great!? What kind of camera do you have and which settings do you use for the close-ups...a micro setting? I got a new camera after mine died and now I am trying to figure out some of the special features for food pics. Hey Harmonia! You know I can never comment on your blog - it blocks me for some reason. My camera is a Canon power shot S500. I just use the little close-up button on the back of the camera. Aren't the dogs funny? They always end up in the same position - like they plan it or something. oh renzo and bella are so cute and so well behaved. a very wild and crazy porkchop and mr daniels say hello. What a great meal! You know...since your daughter is practically the same age as me-we can just do a little switch-a-roo for a couple of months--so, I get to eat some of your fab dinners!! I can't wait to start making stuff from TEV-I just got my copy off of Amazon. 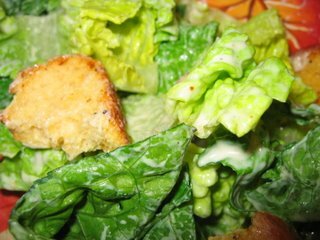 That Caesar dressing is at the top of my list! 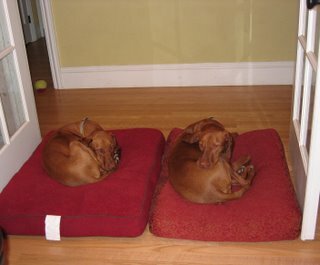 Last, but not least-your doggies are so cute! I like their names also. Gosh, do you think I can switch my flight and come in a day early just so you can cook for me...pretty please!!! Can't wait to see you sista!